The Generation Rx chapter at the University of North Carolina at Chapel Hill were in the top three chapters recognized for the 2013 AphA Generation Rx National award, and were named the the Runners-Up that year. 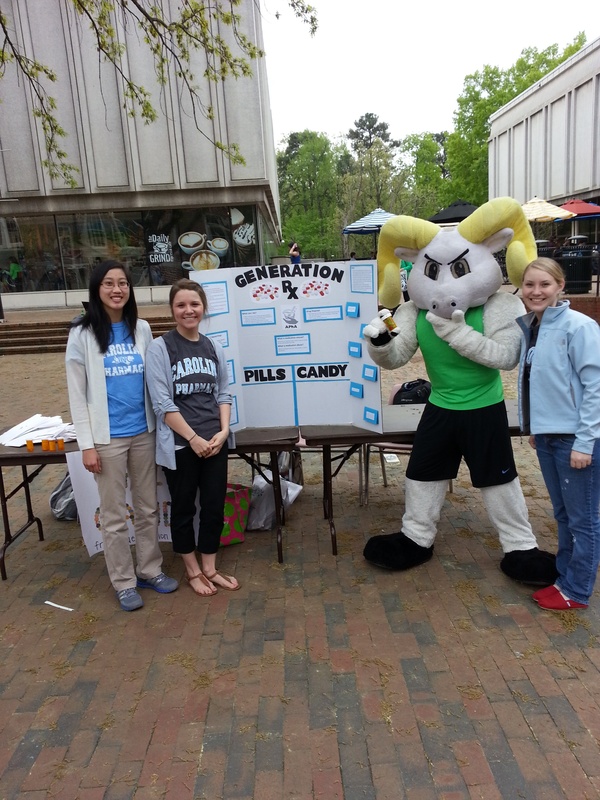 To find out what makes their program so successful, we interviewed Rachael Carpenito, Marti Guidotti, Meghan Maples, and Beth Tevepaugh from the University of North Carolina at Chapel Hill’s Generation Rx chapter. The students at the University of North Carolina have been recognized nationally for their work in prescription drug abuse prevention. What has made your school so successful in its Generation Rx projects? What advice can you offer to other colleges to help prevent the misuse and abuse of prescription medications? There are numerous components that contributed to UNC’s success in its Generation Rx projects. Passionate leadership with a drive to achieve goals, develop lasting relationships in the community, instill excitement amongst the student body, and create resources for future projects have ensured that Generation Rx projects are extremely impactful. The creation of the “Natural High Series” served to both educate students and provide them with tools to be the best advocates in the community for preventing the misuse and abuse of prescription medications. This Series has continued consistently since its launch and is now one of Generation Rx’s most anticipated events. With the Series, involvement and excitement for other Generation Rx programming increased greatly. New community relationships, such as UNC Horizons and Interactive Theater Carolina (ITC) expanded the project’s reach to populations never impacted before. With UNC Horizons, we were able to present to new mothers hoping to sustain a drug-free lifestyle, and we worked with ITC to create interactive scripts about difficult situations faced in regards to prescription drug abuse. These are just some examples of community collaboration that allows us to expand our reach alongside organizations with the same missions. We encourage other colleges to start the year with a set of measurable goals and develop a foundation of passion and interest in Generation Rx among the student body. Once students have a true understanding of the purpose of Generation Rx, they will be able to work together to create innovative and impactful events that serve to accomplish your goals and prevent the misuse and abuse of prescription medications. If you were starting Generation Rx activities at another school, what is the first thing you would do? It is important to first make strong efforts to understand the mission of Generation Rx and then perform an environmental scan of the needs of your community. Once these steps have been taken you can develop goals that aim to fulfill the needs of Generation Rx as it applies to your surroundings along with the interests of your student body. Just as essential to performing background research is to educate your student body in order for them to join in efforts to accomplish your goals and have the biggest impact. What does Generation Rx mean to you? Generation Rx is an opportunity to give back to the community in areas that have directly affected many of the student pharmacists at our school. This intimate connection with the initiative has provided added perspective that it is our duty to our patients, colleagues, and the community to join the mission to prevent prescription drug misuse and abuse. As an organization of pharmacists and student pharmacists, there is even more credibility to the education we provide as one of the more trusted health care professionals specifically trained to discuss these topics. 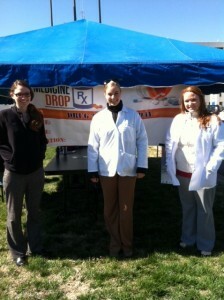 What is the most memorable experience you have had while teaching others about prescription drug abuse? 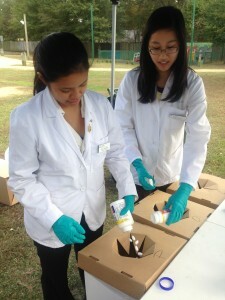 UNC student pharmacists help collect unwanted medications during a local medication take-back day. With regard to teaching patients, one of the most memorable experiences was through an organization called UNC Horizons where a student pharmacist had the opportunity to converse with young mothers recovering from drug abuse. In her discussions with the mothers, she was able to educate them about the realities of medication abuse. One mother spoke to her and thought, “If one is good, two must be even better,” – a common misconception with medications. This was a great opportunity to comment on how medication dosing is based off science and years of studies. She spoke about the basic pharmacokinetics of medications and that in some cases, medications can build up in one’s system and lead towards bad side effects and toxicities. She also highlighted the risks of acetaminophen poisoning for pain relief as an OTC product as well as abuse of opioids combined with acetaminophen. The student felt that after their discussion, the mothers viewed medications differently and would be more conscious of how to use them for themselves and their children. It was wonderful to see the mothers learning how to be advocates for themselves, an important life skill they would need when rejoining the community. Another memorable experience where student pharmacists were greatly impacted was with the North Carolina Pharmacist Recovery Network (NCPRN) Panel. This event was made possible from the relationship between a Generation Rx leader and an NCPRN representative at the Utah School of Alcoholism and Other Drug Dependencies. With the NCPRN Panel, it provided student pharmacists with the opportunity to meet and hear stories from pharmacists who are recovering from addiction. It is not in the forefront of most students’ minds when entering a healthcare profession that they are at risk for medication misuse and abuse. This Panel was eye-opening to those who attended to see that addiction can affect anyone, and students felt it was very helpful to hear stories from their colleagues in order to empower them to be self-vigilant. Why do college students need to be concerned about medication safety? 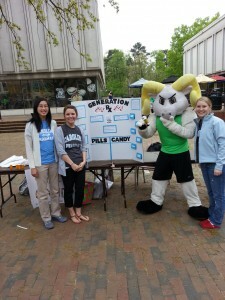 Rameses (the Tar Heels mascot) joined our students to raise awareness about the dangers of misusing stimulant medications. College students are under a great deal of pressure to perform well and achieve in order to mold their futures. In the face of this, students are willing to turn towards prescription medications in order to cope with the pressure and achieve short-term success. One student may use amphetamines in order to stay awake to study for an exam, and another may turn to benzodiazepines to ease the anxiety about upcoming deadlines or interviews for future careers. For most students, college is the first taste of independence and they may not have yet learned the consequences of their actions. While we advocate appropriate use of medications, their abundant presence and ease of access on campuses have opened the doors for misuse and abuse that is only encouraged by the misconception that because they are prescriptions they are safer than street drugs. Education and empowerment around safe use of medications can help save the lives of many college students and teach them the benefits of positive choices for long-term success. If you could tell everyone only one thing about prescription drug abuse, what would it be? Why? It is important for people to be their own advocates in the face of prescription drug abuse. Medications are complex and can be dangerous, but prescription drug abuse is more preventable than some may think. Taking responsibility to learn everything they can about medications they come in contact with will help them to use the medication as intended. Not only will they learn to store medications properly and adhere to prescribed regimens, but they will also know the consequences of misuse and abuse in order to be able to make the right decisions before being faced with addiction. Many are already struggling with addiction. It is important for us all to view addiction as a chronic disease, similar to hypertension and diabetes. It is not a choice, it should be talked about openly, it can affect anyone, and it requires ongoing care and support. Treating it as such will encourage those afflicted by it to reach out for help. Photos courtesy of Macary Marciniak.